VISINE® ALL DAY COMFORT DRY EYE Relief is formulated with GentlePUR™ Technology to lock in the soothing moisture your eyes need to stay comfortable all-day (or night) long. I have extremely dry eyes and have tried many dry eye drops. These drops not only burn my eyes, but they make my vision very blurry and distorted for about 20 or so minutes after use. Very disappointed. We're sorry to hear this so we'd like to learn more and help! Please give us a call at 1-888-734-7648 from 9AM - 5:30PM ET, Monday through Friday. Hope to hear from you soon! Excellant product!! It does last all day and I do not have to use as much!! Definitely worth the price!!! Woke up with one eye feeling like I had sand in it. Bought this and as soon as I put two drops in, I started feeling much better. Highly recommend this product. Have been using this product constantly since 1998, when it used to be called "Visine Tears". It's the only product of its type that I can use with no pain or side effects. This site needs to be updated however, as the 1oz size was discontinued years ago, annoyingly, and the ONLY store that has ever carried this brand is Walmart, but they never restock. VISINE Dry Eye really helped to relieve my burning, irritated dry eyes. 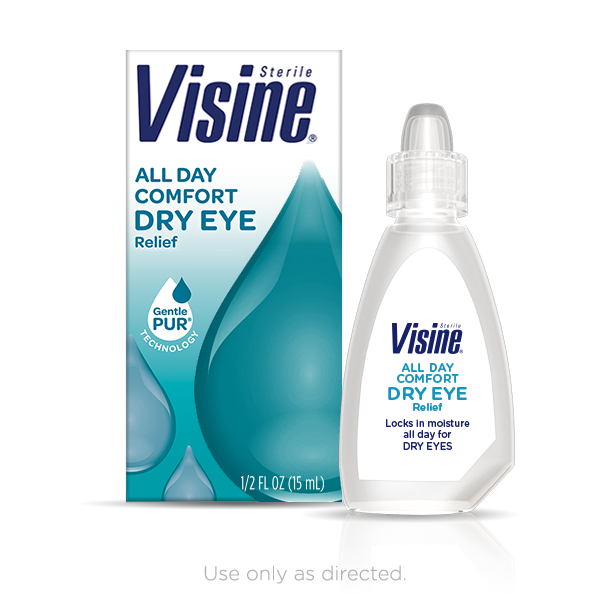 I wear contacts all day, so I use VISINE Dry Eye eye drops to help get me through the day. works great, I have very dry eyes and this helps so much. I love this product and it helps dry eyes! It is a wonderful product to buy!